On Saturday 14 April 2018, fire broke out at Casula in the south of Sydney. 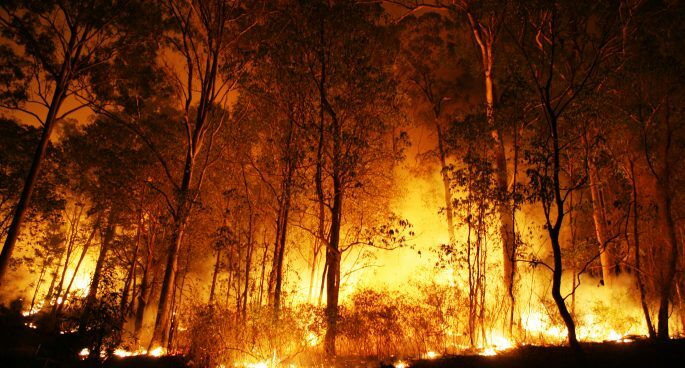 Strong winds spread the blaze south east towards Wattle Grove, Holsworthy, Voyager Point and Pleasure Point, eventually impacting an area of more than 3,800 hectares. The fire is thought to have been deliberately lit. The fire reached the Benedict Industries quarry at Sandy Point on Saturday evening and the NSW Rural Fire Service dispatched two fire trucks with full crews to the site to protect the offices, workshop, mobile plant and diesel fuel storage facilities. We would like to offer our sincerest thanks to the men and women who attended our site. Thanks to their professionalism and expertise, no damage to property or personnel was incurred. Further crews commenced backburning on Sunday morning , successfully protecting the Sandy Point and Picnic Point communities. Benedict Industries were very proud to be able to assist the NSWRFS Aerial Firefighting Helicopters in their efforts. Our onsite dams were a crucial source of water for the Monsoon Buckets used to contain and extinguish the fires over a four day period. A significant portion of our water reserve was provided by our dams with helicopters queueing up to four at a time to retrieve water. We would like to commend the NSW Rural Fire Service, NSW Fire & Rescue, the NSW Police and SES as well as the communities in the Holsworthy Menai area. An extremely hazardous situation was brought under control thanks to their skill and professionalism. The fire is now contained however the NSWRFS will continue to monitor and undertake regular patrols of the fire ground over coming days. Smoke will continue to be visible from the area as unburnt bush, well within containment lines, continues to burn out. Smoke is also likely to settle over parts of the Sutherland Shire, Macarthur, Cumberland and Greater Sydney areas.